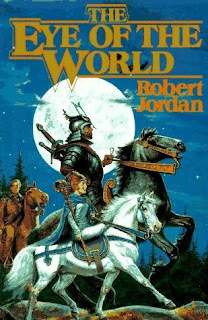 I stumbled upon Robert Jordan's 'The Wheel of Time' series by accident. Back then, I was fourteen and living in Trivandrum. My parents had a copy of the first book, The Eye of the World, and I read it purely because the cover looked so interesting. (Just look at it - doesn't it promise awesome adventure and excitement?) I finished the 800-page book in two days flat. Of course, it was only when I was nearing the end of the book that I realized that it was just the first of an entire series. But I didn't bother searching for the rest of the books in Trivandrum, because I was very sure I wouldn't get them. So imagine my excitement when I landed up in Delhi and discovered that my school library had the entire series! Unfortunately, I was in twelfth by the time I made this discovery. And each of these books is a whopper - at least six to seven hundred pages long. I was sure that eyebrows would be raised at a twelfth standard student issuing big fat works of fiction. So in order to fool the librarian, I would get a Jordan book and a Physics/Mathematics guide issued together. But her eye got beadier and beadier every time I brought the next in the series to her desk. And I had just finished reading the fifth one when the blow fell - she told me that twelfth graders were not allowed to issue fiction. I should have protested, of course. Stifling students' imagination and all that blah blah. But she was one scary lady - huge and bulky and capable of silencing an entire library-full of students with a clearing of the throat. And I was just a spineless sixteen-year-old. Besides, I had already realized that I wouldn't be able to complete the series by the time the Board exams arrived. So I gave in. But now I've discovered the series again! And it is still every bit a rollicking yarn as it was when I was fourteen! (So much so that I didn't even want to go out with my friends last night.) Unfortunately, my reading speed seems to have come down considerably from when I was in my teens, so the series might take me some time to finish this time around. But it's okay - I have time. After all, the final book is going to be published only in 2012! have you read "the amulet of samarkand" and the following two books by jonathan stroud-the bartimaeus trilogy. P.S.- and i ask a recommendation in turn-have you read the artemis fowl series of books?are they any good? Janus: Nope, haven't read the Bartimaeus trilogy. I've read the first two Artemis Fowl books - found them kinda blah. Have you tried the philip pullman series? Or even orson scott card (closer to science fiction though). And the bartimaeus trilogy is certainly brilliant. The Dark Tower series by Stephen King had me hooked..
Vasant: Yup, read Pullman. The Bartimaeus trilogy sounds interesting, though I'd never even heard of it before Janus mentioned it. Shrik: But is it fantasy fiction? It seemed more like sci-fi to me - isn't it set in the future or something?